I've often felt like a failure as a mom. Still do sometimes. It was rough raising our kids; they came with a lot of "stuff" they had no control over. When they were little, I was pretty sure that with enough love, sunshine, therapy and nutritious food, they'd all turn out perfect. I'd have handsome sons and beautiful daughters who loved visiting Mom and Dad, who were all active Catholics and who stunned everyone who met them by all they'd overcome. You might imagine reality is a bit different. This is not to say I'm not proud of my kids. I am enormously proud of them. But the family I have is not the family I pictured 20+ years ago. And I thought that meant I'd done something wrong. It must be my fault that 4 of my 5 kids don't go to church. It must be my fault that I've got two kids that struggle with drug and alcohol issues. It has to be my fault that I've done more psych hospitalizations than most ER attendings. I had social workers on speed dial for years. I knew several of our county sheriffs by their first names. This was not your typical parenting, people! I look around at peers, and I see their kids doing the seemingly "normal" young adult thing: college, jobs, sports. There are the Facebook posts about Dean's Lists and sorority sisters and internships. That's not our story. Our story is really...lumpy. And not pretty. And hard. Our story has a lot of anger and crying and total misunderstandings and how the hell did I miss THATs?? I imagine my kids have felt this way many times. I simply could not do for them everything they needed - I'm far too flawed. In late summer, Curly-Haired Daughter got married. I was dancing with Youngest Son (who is now close to 6'7"). At the end of the song, he grabbed me and wrapped me in a monstrous hug. He said to me, "None of this was your fault, Mom. It's all on me. You've been great." This boy is still struggling to figure his life out, but he's come so far. He has chosen not to live with us right now, and honestly, it's for the best. He's doing very well where he's at. But I still hurt for him, with him.He's had a lot of anger running through his soul, as Mr. Clapton put it. Despite all that, he reached out to his mother - and let me know that I was okay. 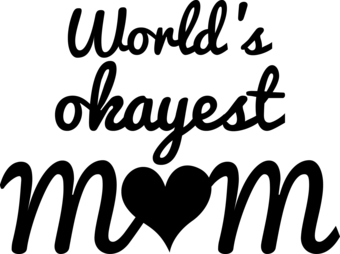 I"m an okay mom. I'm not the world's greatest mom - just ask my kids. But even though they only had an okay mom, they've turned out to be really awesome people, who are still becoming really awesome people. Yes, our family story is "lumpy" but it's lovely and sweet and passionate and forgiving as well. We know we all have a hand to hold. i understand you so much!when i became a mother i also was thinking about how bad i am, but you know what?after the first words that my child said i understood that its not true and i`m a good mother that love my family and make my family happy, so now i`m writing my blog about motherhood https://kovla.com/blog/what-s-motherhood-in-life-of-russian-women/ enjoy!